Materials: travertine, rope, supporting structure in iron. Dimensions: m. 10 x 3 x h 4. The sculpture was created for the Visioni di Hymnen, a collective exhibition for which young Italian artists were invited to design original scenery for the music of Stockhausen. 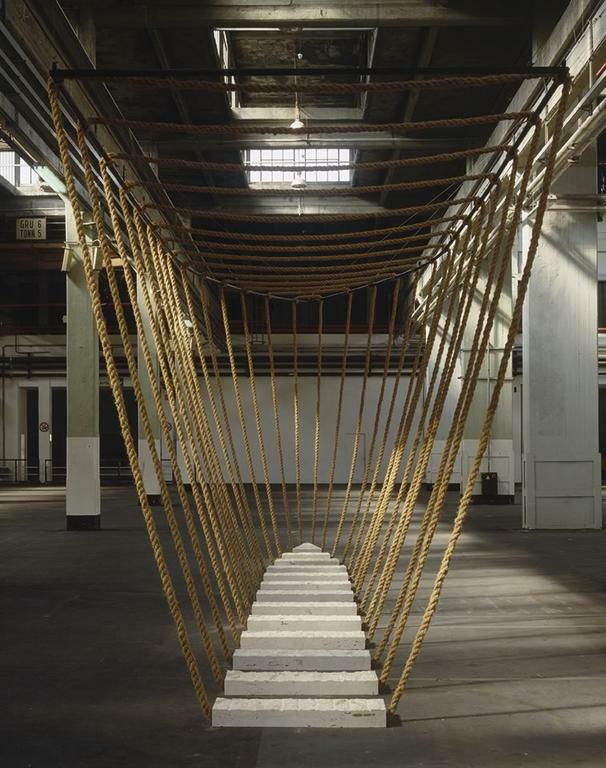 Thirteen blocks of travertine, which appear to be held by a rope tied to the ceiling beams so as to amplify the work’s spatial form, were cut and arranged in order to recall the hull of a ship. 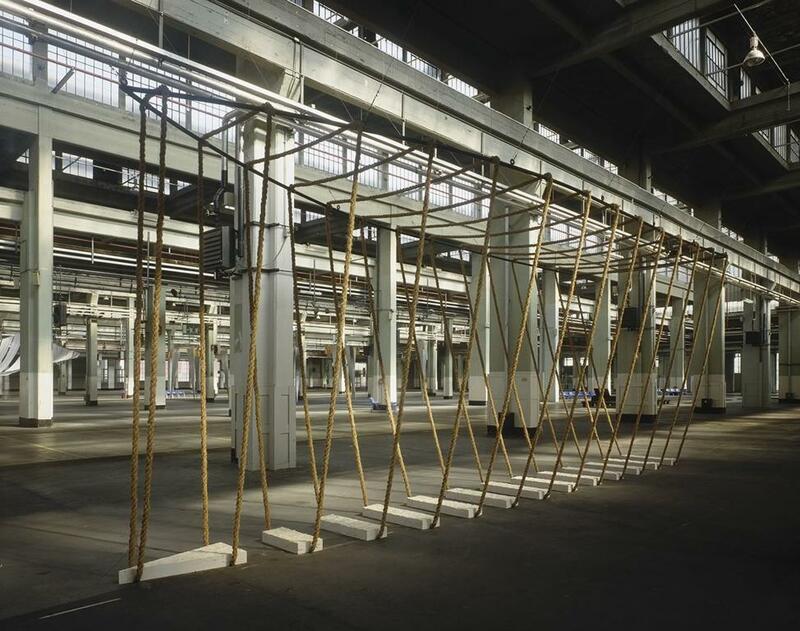 The vastness of the Sala Presse, a room inside of the industrial building designed by Giacomo Mattè Trucco in 1919, is in itself a difficult space to confront; empty, enormous and dispersive, it is dilated by the spatial influence of the diaphragm created by the ropes: the ropes themselves, in fact, articulate and give rhythm to the space, even beyond the physical dimensions of the incursion itself, reaching out to the void of the former factory, creating a kind of open scene. 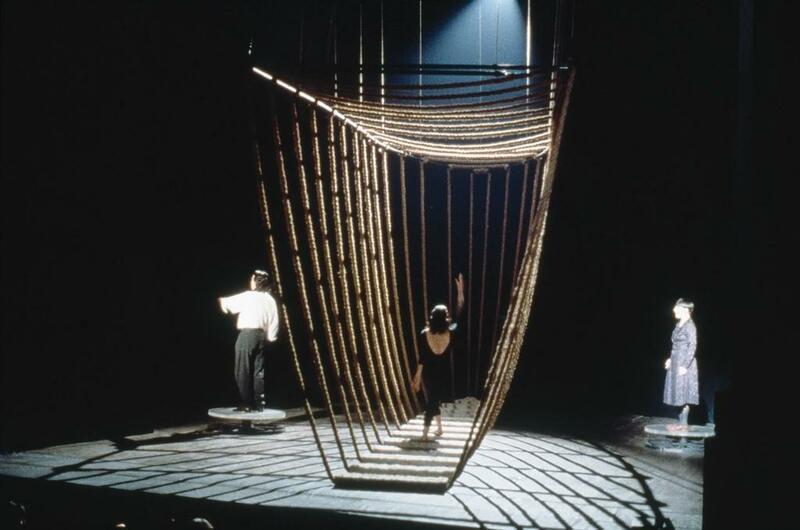 This theatrical vocation found its fullest realization in the show ‘Naufragio con spettatore’ (Shipwreck with spectator), produced by ‘Settimo Voltaire’ which used Maria Dompè’s work for the stage design.